The Great Gatsby, written in 1925 by F. Scott Fitzgerald, was deemed a failure. It was selected to be printed in a special paperback format for distribution to servicemen in 1945. They loved it, and told the folks back home. The Great Gatsby became a literary classic. Hundreds of thousands of men entered the military in the early 1940s. The transition was rough. They were never alone, no privacy. They were told when to wake, when to eat, how to dress, what to do. Morale in the training camps sagged. The Army’s Library Section wanted to supply the camps with books, but lacked funding. Librarians across America organized book drives, and books poured in. The Victory Book Campaign received four million books by early 1942. One and a half million were rejected as unsuitable for young men, such as children’s books, such topics as knitting, or discards no one wanted. As the men moved overseas to join the fighting, books were treasured. In the Army, the men were dirty, exhausted, eating unappetizing rations, and fighting boredom when not fighting battles. Books allowed them to leave reality behind and travel in their minds to a happier place, find humor where there was none, and stay in touch with American life. Thumbnail images of the original dust jackets appeared on the covers. In 1943, the military began buying millions of paperbacks through the Council on Books in Wartime. The books were specially designed. Paperbacks hadn’t been common until now. Publishers and booksellers preferred durable hardcovers with higher profit margins. But hardcovers added extra weight to the already overburdened servicemen. 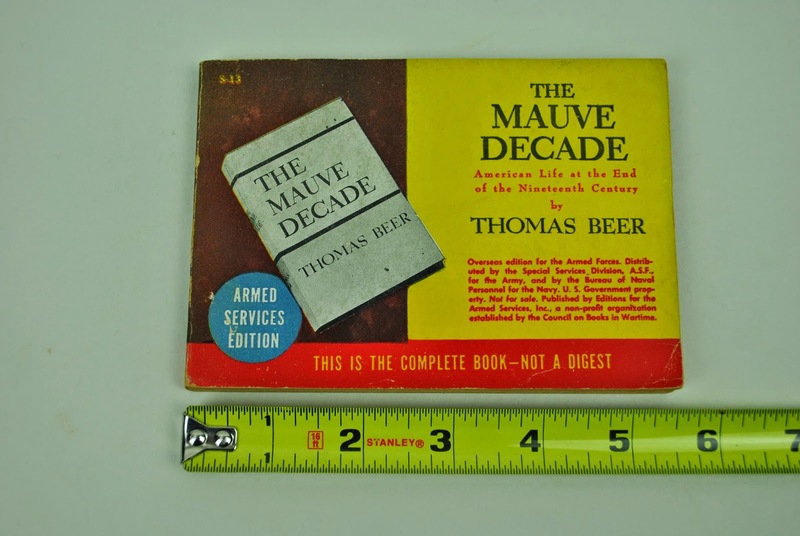 The Armed Services Editions (ASEs) were sized to fit in pockets. They came in two sizes. One was 6½” x 4½” for pants pockets; the other was 5½” x 3⅜” for breast pockets. In thickness, they ranged from less than ⅛” to ¾”. Bound on the short side, each page featured two short columns of text, thought to be easier on battle-weary eyes. Titles were selected for a range of variety. Authors of selections received bags of letters from grateful servicemen. With popular books like A Tree Grows in Brooklyn, a waiting line developed among the men. As the war wound down, practical nonfiction titles were chosen to help the men plan for their futures. Small, lightweight books traveled with the men to the front lines. In the D-Day marshalling areas, books were distributed one book per man. In hospital, the feather-light books were easy for soldiers lying in bed to hold. Many men who hadn’t been readers came out of the war as readers for life. I just read this a week late. Very interesting. Interesting that they liked the Great Gatby.